ELECTROCARDIOGRAM (ECG) –A measure of electrical heart activity to detect problems such as blood supply/irregular rhythms. TRANSESOPHAGEAL ECHOCARDIOGRAM –A procedure to perform ultrasound of the heart via a probe through the mouth. AMBULATORY BLOOD PRESSURE TESTING –A test to continuously measure blood pressure over 24 hours. PERIPHERAL ANGIOGRAM (Aortic, Renal, Limb) – A test which injects contrast (dye) into a vessel in the body (leg, arm, kidney) to see if arteries are narrowed or blocked. PERIPHERAL ANGIOPLASTY (Aortic, Renal, Limb) –A procedure to open blocked or narrowed arteries using a balloon after which a small metal/mesh tube called a stent is inserted into the open artery. PERIPHERAL ANGIOPLASTY –A procedure for opening narrowed arteries to the upper and lower limbs (legs). ENDOVASCULAR AORTIC REPAIR (EVAR) –Thoracic and abdominal aneurysms / dissection repair. HAEMODIALYSIS ACCESS AND MANAGEMENT –A procedure to cleanse the blood in patients with abnormal kidney function. FISTULOGRAM/FISTULOPLASTY –A procedure to diagnose and clear/open narrowing fistula implants. CEREBRAL ANGIOGRAM –A procedure used to detect brain aneurysms or other brain abnormalities. CEREBRAL EMBOLIZATION (COILING) & STENTING –A procedure for the closure of an aneurysm (dilatation) or a vascular malfunction in the arteries of the brain. DIAGNOSTIC & THERAPEUTIC RADIOFREQUENCY ABLATION –Treatment of fast/irregular heart rates. CARDIAC RESYNCHRONISATION THERAPY –BI Ventricular Pacemakers and CRT-D insertion. The heart acts like a pump, it generates a pressure, which enables it to pump blood through the lungs and then to the rest of the body. In order to do this the blood must flow only in one direction. The heart accomplishes this because of four one-way valves present inside the heart, which open and close in synergy with each pump of the heart, thereby allowing blood to flow in one direction. If these valves become defective,which could occur as after a valve infection or a heart attack involving the valve, they either become stiff and cannot open which is called stenosis or they may become too flaccid to close which is called incompetence or it may be a combination of both these conditions. When this occurs the pump is unable to generate enough pressure to pump blood throughout the lungs and around the body. During surgery the valve is either repaired or replaced. The aorta is the main pipe that takes blood from the heart and directs it to the rest of the body. Sometimes because of hypertension or a genetic disorder the aorta can actually blow up somewhat like a balloon. 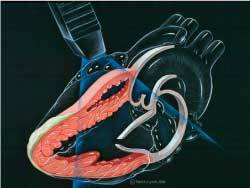 This ballooning of the aorta is called an aortic aneurysm, which can eventually rupture causing sudden death. Depending on the location of the aneurysm on the aorta it can be repaired with a tube graft at surgery or it can be reinforced by placing a stent in the area of the aneurysm. Sometimes due to high pressure or an accident the aortic wall itself may start splitting. This is called a dissecting aorta and depending on its location results in a medical emergency. A dissecting aorta can be repaired by a cardiologist performing a tube graft or stenting in the area of the dissection. An Aortic dissection is a serious condition in which the inner layer of the aorta, the large blood vessel branching off the heart, tears. Blood surges through the tear, causing the inner and middle layers of the aorta to separate(dissect). If the blood-filled channel ruptures through the outside aortic wall, aortic dissection is often fatal. Sometimes patients are born with heart defects. This is called congenital heart disease. There are a multiplicity of congenital heart defects some of which have to be repaired surgically as an emergency, as in transposition of the great vessels, or electively as in atrial septal defects. On some occasions patients with congenital heart disease survive to adulthood before the defect in the heart becomes clinically significant. Depending on the defect, correction could be achieved by either surgery or with Interventional Cardiology. CORONARY ( AORTIC, RENAL, PERIPHERAL ) ANGIOGRAMS, INCLUDING PAEDIATRIC CASES –A procedure during which an interventional cardiologist injects a dye via a special catheter into your coronary arteries in order to obtain x-ray images of the blood circulation within the heart. CORONARY ( AORTIC, RENAL, PERIPHERAL ) ANGIOPLASTY AND STENTING –A procedure to open blocked or narrowed arteries using a balloon, after which a small mesh tube called a stent is inserted into the open artery. FIBROID EMBOLIZATION –A non-surgical invasive procedure to destroy fibroids in the uterus. NEURORADIOLOGICAL PROCEDURES –These are Cath Lab procedures that are alternatives to brain surgery such as Cerebral Aneurysm Coiling and/or Stenting and repair of AV malformation. Cerebral Aneurysm Coiling and/or Stenting is a procedure for the closure of an aneurysm (dilatation) or vascular malformation in the arteries of the brain and repair of AV malformation. 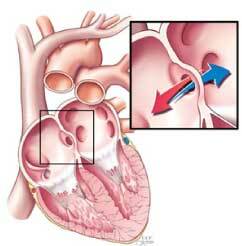 VALVE VALVULOPLASTY –A procedure to repair narrowed heart valves (stenotic). RENAL ABLATION –A procedure for the treatment of patients with severe hypertension by ablating the kidney arteries. GENERAL CARDIOLOGY CLINIC:Including treatment of coronary artery disease, Hypertension, heart failure and other cardiac pathologies. CARDIAC SURGERY CLINIC:Our cardiothoracic surgeons diagnose and treat, Patients in need of bypass or valve surgery. ARRHYTHMIA/ELECTROPHYSIOLOGY (EP) CLINIC:Treatment to patients with irregular, slow or fast heart rates, dizziness, fainting. 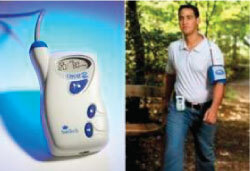 VASCULAR CLINIC:Patients with peripheral artery disease, nonsurgical treatment of diabetic feet. ANTI-COAGULATION CLINIC:Drug treatment to regulate the clotting process in the blood. ECHO CLINIC :This clinic, which is unique to the Caribbean, is done by Cardiologists specialised in Echocardiography who can perform 3D ECHOs, Exercise and Pharmacological Stress ECHOs and TEEs. They also assist in diagnosis and screening of valve and congenital heart disease. This department was founded in 2012 and since then has received several grants from patients and institutions, which have been dedicated to research and education on Cardiovascular disease. Several articles have also been published in peer reviewed and indexed journals. Several local and foreign consultants participate in this Research and Developmentinitiative assisted by two directors: Professor Gianni D.Angelini and Dr. Risshi D. Rampersad. Anomalous origin of right coronary artery with aortic stenosis. A rare combination. George A, Rampersad RD, Camargo S, Angelini GD. – CMJ Volume 75 No.1 June 2013. A Medical First for the Caribbean. 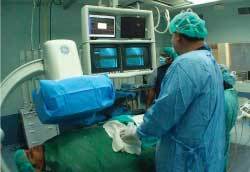 Caribbean Heart Care Medcorp team performs brain procedure on baby. Sometimes in order to understand the character of a patient’s blood pressure we need to measure it continually throughout a twenty four (24) hour period. At the end of the period the patients blood pressure measurements are printed out on a data sheet for analysis by the Cardiologist. The carotid arteries in the neck take oxygenated blood from the heart to the brain. When these arteries are blocked the patient becomes prone to a stroke. 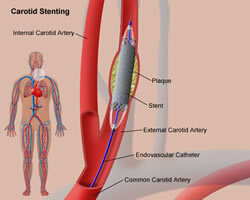 We perform angioplasty to these arteries thus preventing strokes in patients with carotid disease. If you are unable to exercise, this non invasive test is an alternative to an exercise stress test for evaluating coronary artery disease. The medication dobutamine is taken to stimulate the effects of exercise on your heart and an echocardiogram is done before and after the medication is administered.. This is a non-invasive procedure. A probe is placed on the chest wall or in the stomach. 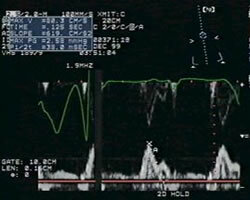 A picture of the blood flow of the heart is generated and displayed on a monitor. This test is particularly important for assessing the heart valves. Sometimes the probe is inserted into the stomach instead of the chest wall. This is called a transoesophageal (TOE). There are many procedures that are done in our Cath Lab that avoids patients having to undergo brain surgery. Procedures such as Cereberal Aneurysms, AV fistula and chemoembolisation for brain tumors are all undertaken at our Cath Lab. This is commonly called a hole in the heart. It is a defect in the septum that separates the right and left atria thus allowing mixing of blood between the right and left sides of the heart. Now instead of having to undergo open heart surgery to close this defect it is closed at our Cath Lab using a device called an umbrella. The patient usually has a hospital stay of 24 hours. We also perform other paediatric heart procedures such as PDA’s and valvuloplasties.